Hitachi Vantara has hosted one final event under the Pentaho banner before the ‘company’ finally now becomes part of the deeper ‘brand’ under Hitachi Vantara. Pentaho itself is 13-years old was it was founded under the principles of being an embeddable, extendable data analytics platform. President & COO of Hitachi Vantara Brian Householder set out the stall for the firm’s current approach to data analytics inside of the Hitachi parent. “We are of course focused on helping our customers become more profitable… but we have a second mission as well… and that is all about focusing on helping society work better… and that is what we call our ‘double bottom line’ and this event is designed to help explain more about what that means,” said Householder. Looking back at the history of Hitachi with a view on Pentaho itself, Householder explained how the firm (Hitachi) went from being a software and services company to being a business that looked more directly at becoming a specialist in data and analytics… hence the acquisition on Pentaho back in 2015. “We also really liked the fact that Pentaho was an essentially open source company and we really liked the way Pentaho worked to champion the open model of design and software development,” said Householder. Now with a very strong focus on Internet of Things (IoT), Hitachi Vantara has worked to explain in detail how its Lumada IoT platform fits into the current picture for this new divisionally grouped wider organisation. Many firms are only digitally analysing as little as 5% of their data. Even at best, progressive firms are only digitally analysing perhaps 50% of their data. 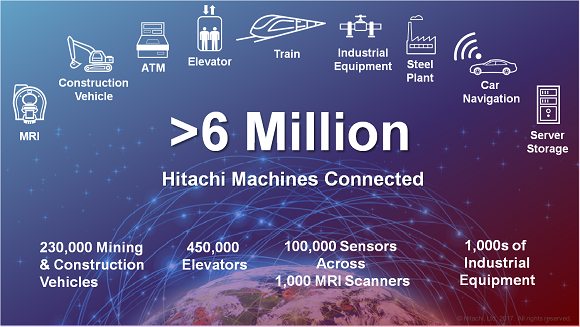 Hitachi Vantara sees a lot more analytics happening at the meta data layer… especially as we move from the world of applications that churn through terabytes onward to petabytes… and then even more so as we move to exabytes. The firm says that a whole new tier of analytics will emerge at the meta layer (where exabytes of data is held) so that applications can feed from a more tuned, refined, analysed, intelligently automated (and essentially smaller and more accurate and de-duplicated) pool of data. Another key trend highlighted by Hitachi Vantara is that the data will outlive the application that created it. The average useful application will soon only last perhaps around one to three years… but the data that these apps channel, use, change, affect, ingest and output will last far longer than this. Businesses are thinking in linear terms… but technology is changing in a non-linear way. If we accept the law of accelerating returns we have to accept a new cadence of innovation. As Ray Kurzweil has said, “An analysis of the history of technology shows that technological change is exponential, contrary to the common-sense ‘intuitive linear’ view. So we won’t experience 100 years of progress in the 21st century — it will be more like 20,000 years of progress (at today’s rate). The ‘returns’, such as chip speed and cost-effectiveness, also increase exponentially. Speaking as part of the Hitachi Vantara keynote, Forresrer analyst Brian Hopkins has asserted that adding IoT to a business requires a data fabric architecture… plus also, that architecture needs to be optimised for the public cloud … and, thirdly, a business needs to be architected in order to scale (to webscale) for growth. This breadth of understanding in terms of where data storage exists and happens vs. where compute happens has significant implications for firms who are on the road to so-called digital transformation with its building blocks of cloud, big data analytics and perhaps also quantum computing when it finally arrives. The future for Pentaho under Hitachi Vantara appears to be positive in the sense that the parent firm (although it will no longer host a separate PentahoWorld conference, it will form part of Hitachi Next 2018 in San Diego) will now invest significantly in the analytics engine it has acquired. Where some acquisitions are perhaps more cynically designed to absorb market share, kill off competitor brands or land-grab additional customer base — this (by all evidence presented) is not the case here, so let us hope the open computing credentials are also maintained.